I’m just back from a study tour of Chinese brewing equipment and can tell you what’s good and what’s bad. The first time I went to China was 3 years ago and at that time I was visiting 3 manufacturers to decide on equipment for a client. The equipment we saw was variable at best but the client was more concerned about the price rather than the capability of the brewery to deliver good, consistent quality. This time around I visited on behalf of future clients so this tour took me from Wenzhou and Ningbo (south of Shanghai), to Shanghai and the way up to Jinan (south of Bejing). After a 10 hour flight to Guangzhou I arrived in China on time but the connecting flight to my first destination was delayed about 3 hours. Little or no explanation was given. But when I finally landed at the next destination (where the 1st manufacturer is) I realised why the hold up. The airport was still suffering the ill effects of the aftermath of the Typhoon that struck the area 2 days before. The airport was probably 50% under water. It was a difficult landing as the pilot had to brake hard on the reduced runway and when I got off on the tarmac I was guided into the transit bus which has to travel through a foot of water to reach the terminal. Being picked up was a welcome relief but the major highway was too flooded to pass through so the driver took the less flooded way which happened to be against the traffic on the opposite side. This lasted for about 2 km and we exited off the “on-ramp” so we were not in the clear until we actually found the correct side of the road after this. So that’s China, I guess. My first lesson in the way things get done there. It gets done in one way or another. So things haven’t changed much since my last visit and so highlighted the point of being wary when purchasing equipment from China. This time around I found the quality ranged from excellent to middle of the road. But when I say middle of the road its not too bad and with a little tweaking can be made into good equipment. So the next thing I looked at was how flexible each company was in working with me to make any changes in their procedures or stock standard way of doing things. 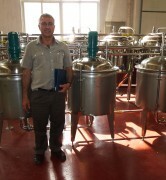 And how consistent were their brewery manufacturing and how good their brewing knowledge was. When I was hosted I regarded the companies that involved their engineer in discussions with me very highly. Those that did not were looked upon by me as less favorable. Then there was the factory visits which varied tremendously in their capabilities, cleanliness and OH&S. Although , as Westerners, we regard cleanliness and OH&S as very important but I can understand that in the East the culture of these things are sometimes not quite up to scratch so I did not necessarily place great emphasis on this. As long as the equipment coming out the other end was of satisfactory quality and consistent. So what about the investment you may be able to make in a Chinese brewery. Is it cheaper than European or American/Canadian counterpart. In general yes, but some of the top manufactures in China can come with a higher price tag. So it really depends on your budget, your expected output (size of brewery), the level of automation and the visual affect you want to present in your business. Of course the quality of beer should always be the number one consideration in choosing a brewery. So if you are even thinking of starting your own brewery should you go direct to the manufacturer that someone has told you about or you’ve found on the internet, or, should you go with a consultant with proven experience in brewing who can direct you in the right way. Yes, I know the temptation of going direct and you will no doubt consider that. But I know of people who have done so only to find they produce infected beer most of the time. Not because they are a bad brewer but because their equipment was not up to standard. So now they call their beer ‘lambic’ style! When all is said and done paying a consultant is really money well worth spent. And it will most likely cost you less overall with the added benefit of getting a brewery that is suited to your budget and delivers on quality and is a delight to work with every day. I should know because I have brewed on some ordinary breweries and it is no longer a place I looked forward to working and it become a chore and continuous drain on my energy. You can also struggle every time to brew beer of good, consistent quality. So do your homework and don’t rush into purchasing a brewery just because it is cheap! Usually that translates into a cheap and nasty brewery that just does not deliver. A lemon! For those that want to discuss their brewery project with us why not arrange an initial consultation which is fee based. I don’t really like to have free initial consultations because what I offer is targeted good advice, based on decades of experience, and discussions about your needs, not ours. When is craft beer not craft beer? Why analyse beer, after all its just a hobby?